Whole-body scans (WBSs) based on diagnostic or therapeutic doses of iodine-131 (I-131) can visualize metastatic lesions in thyroid cancer patients who have undergone total thyroidectomy. However, a variety of unusual lesions may cause false-positive results, and therefore, careful evaluation of abnormal scans is imperative to avoid unnecessary surgical removal or high-dose radioiodine treatment. Here, we report a patient with pulmonary aspergilloma mimicking metastasis of thyroid cancer on WBS. A 44-year-old female underwent a total thyroidectomy, bilateral modified radical neck dissection and paratracheal lymph node dissection for differentiated thyroid cancer (DTC) of the papillary type on the right lobe and bilateral neck metastasis. Histopathology revealed extrathyroid extension of the cancer, bilateral neck and in one paratracheal lymph node metastasis. Thyroid function tests 4 weeks after surgery were thyrotropin >100 μIU/ml, thyroglobulin was 0.2 ng/ml and antithyroglobulin antibody was 1.29 U/ml. The patient underwent pretherapy I-131 WBS, which showed residual thyroid tissue in thyroid bed. I-131 ablation with 5.55 GBq of I-131 was administered and WBS was obtained after 5 days. The WBS demonstrated usual I-131 accumulation in the thyroid remnant, the salivary glands and the liver. Increased I-131 uptake in the left lung was also noted [Figure 1]. The patient had a history of tuberculosis. 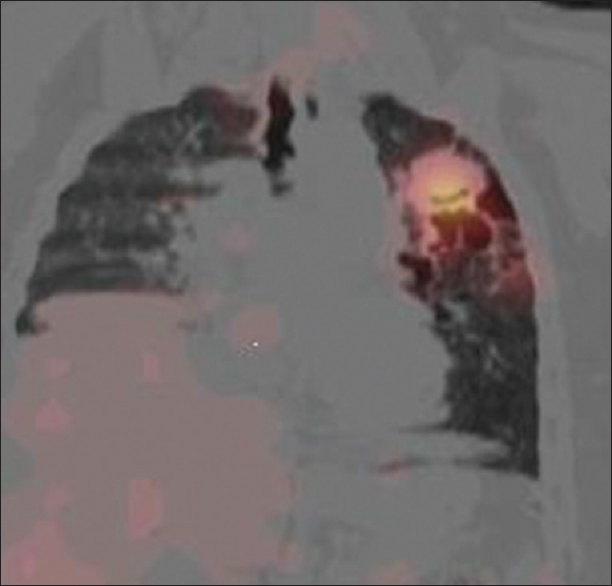 Single-photon emission computerized tomography computerized tomography (SPECT-CT) scan of the chest showed increased uptake in the fibrosis with traction bronchiectasis in the left upper lobe. CT showed soft tissue density lesion in one of the cavitary bronchiectasis suggestive of fungal ball [Figure 2]. A subsequent blood test for precipitating antibodies to Aspergillus antigens produced a result of 35 U/ml (reference range: 0-8 U/ml).The patient was clinically diagnosed as having pulmonary aspergilloma based on serologic test and radiologic imaging results. Mitchell G, Pratt BE, Vini L, McCready VR, Harmer CL. False positive 131I whole body scans in thyroid cancer. Br J Radiol 2000;73:627-35. Carlisle MR, Lu C, McDougall IR. The interpretation of 131I scans in the evaluation of thyroid cancer, with an emphasis on false positive findings. Nucl Med Commun 2003;24:715-35. Shapiro B, Rufini V, Jarwan A, Geatti O, Kearfott KJ, Fig LM, et al. Artifacts, anatomical and physiological variants, and unrelated diseases that might cause false-positive whole-body 131-I scans in patients with thyroid cancer. Semin Nucl Med 2000;30:115-32. Ahn BC, Lee SW, Lee J, Kim C. Pulmonary aspergilloma mimicking metastasis from papillary thyroid cancer. Thyroid 2011;21:555-8. Jong I, Taubman K, Schlicht S. Bronchiectasis simulating pulmonary metastases on iodine-131 scintigraphy in well-differentiated thyroid carcinoma. Clin Nucl Med 2005;30:688-9. Spanu A, Solinas ME, Chessa F, Sanna D, Nuvoli S, Madeddu G. 131I SPECT/CT in the follow-up of differentiated thyroid carcinoma: Incremental value versus planar imaging. J Nucl Med 2009;50:184-90. Thust S, Fernando R, Barwick T, Mohan H, Clarke SE. SPECT/CT identification of post-radioactive iodine treatment false-positive uptake in a simple renal cyst. Thyroid 2009;19:75-6.